Hello, friends! We're so excited to have a new Annie Sloan Before + After to share with you! One of our clients has been updating her home, and she was ready to give her red china cabinet a fresh new look to tie in with the rest of the updates and brighten up the space. We updated it with a light and airy color and finish, and we're so pleased with how it turned out! First, we painted the whole piece, including the shelves, with a fairly thick coat of Old White chalk paint. The "brush-y" look that the piece had after the first coat was very visually interesting and close to what we wanted the final product to look like, but we wanted to add a little dimension and depth, as well as cover the original red color. So, we mixed Old White with a hint of Coco to add a little warmth and dry-brushed the entire piece. Then, we painted the inside of the shelf area with a coat of Coco chalk paint. When that dried, we dry brushed the entire shelf area with Honfleur. During the process of dry brushing Honfleur over the solid coat of Coco on the inner shelves. A note about dry-brushing: go with the "grain". For example, on the shelves, we dry-brushed horizontally (left to right), but on the back wall of the shelves, we dry-brushed vertically. We try to go in the direction of our paint strokes or of "wood" so that it visually makes sense. This totally depends on the details of the piece and the look you're trying to achieve, but we feel like this is a good rule of thumb to start with. Also, make sure to not get too much paint on your brush when dry-brushing. Having a paper plate nearby to dab some of the paint off of your brush is helpful. We finished the piece with Clear Wax to seal it and keep the matte finish and added a little bit of the Copper Gilding Wax to the existing hardware. Then, we styled it with a mix of our client's accessories (she had so many pretty pieces!) and a few pieces from the store. All of the Chalk Paint and Wax we used are Annie Sloan products. We hope this was a helpful before & after! Let us know if you'd like to see posts like this in the future! It’s time to take down the Christmas decor if you haven’t already, and it’s always a little sad to see it go, mainly because of all of the empty space it leaves behind. With the new year beginning, it’s also a great opportunity to start with a clean slate and reassess what you really want your home to look like. You’ll want to be surrounded by the things that bring you joy and warmth during the dreary & cold winter months that keep you indoors. Read on for some great ideas for transitioning your decor and adding life back into your space post-holidays! Clear off all of the spaces you are decorating and give them a good dusting & cleaning before adding more decor. Let go of any preconceived notions of what should go in each spot (or what has previously been there), and let it breathe for a little while. Play with new furniture arrangements if you’ve been itching to change things up; try bringing in an interesting piece from another room! Gather all of your decor into one place, so that you can see it all at once. Decide which items you love and donate or sell any items that you don’t. Make a resolution to only display the things you love in your home. This is also a good time to start playing around with groupings of objects to get a feel for things that are visually interesting together. If you notice gaps in what you have after culling the objects you don’t want and styling interesting vignettes with the things you have left, it’s time to do a little shopping. Don’t rush it… you will know when it’s just the right thing you can’t live without. We always have interesting, beautiful decor at our stores and will gladly help you select just the right pieces. Pro tip: Bring in a photo to help us get a feel for your space so we can better help you find what you’re looking for. Now is the time to start layering in your decor. Make it cozy with soft lighting, candles, chunky knits, and faux fur. To give your space just the right touch, we recommend adding greenery. Houseplants and fresh greenery will cleanse the air and improve your mood during those cold winter months (and all year round!). Don’t have a green thumb? Try faux greenery (we’ll be getting Spring greenery in soon!) to add a very low maintenance pop of green to your space. If you’re ready to redecorate and reimagine your home, we’re more than happy to help! Request a Consultation to get started! It's that time of year again for our Holiday Open Houses. We've been working hard to get our stores ready, and we can't wait for you all to see all of the holiday goodness! We'll have 20% off STOREWIDE (excluding Annie Sloan products) and extended open house hours, so come on by and see us! Check out our 2017 Holiday Open House schedule below for the dates & times for each store. A few weeks ago, we made an announcement on social media about our new event planning endeavor, C&P Gathers. Recently, C&P Gathers had the pleasure of decorating for Murray Main Street's Market to Menu dinner. The event was held in the beautiful Robert O. Miller Conference Center, which was the former Murray post office. We were lucky enough to have a beautiful, light-filled space with HUGE windows to work with and lights strung from the ceiling. To start, we knew we wanted to respect the event, a farm-to-table style meal. That meant keeping the decor simple, rustic, and natural with pops of elegance. We filled our favorite, most versatile glass vases (available in both stores) with beautiful, fresh flower arrangements and greenery from A Festive Touch. We placed lanterns with candles in the window sills and added more fresh greenery around them to highlight the gorgeous windows. We also used these cool, organically shaped gold vases elevated with a vintage wooden piece in the center of the table to define the space. To create ambiance, we filled the tables with lit votives in clear glass holders. The result was a calm, intimate, candlelit setting. 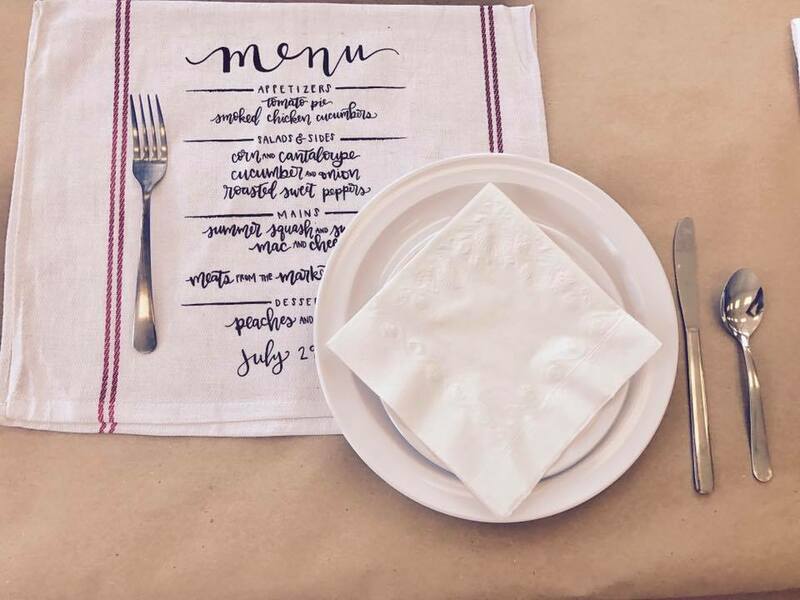 The beautiful menus were designed & lettered by Amanda Newman of PeachesPrintsEtc and printed on farm-style napkins. We set up stately, oversized candle holders in the entrance to welcome guests, as well as a painted chalkboard made from a vintage frame, hand-lettered by our own Megan Hendrix. Special thanks to Murray Main Street for having us! We loved decorating for such an awesome local event. Evenings such as these are why our town is so special! Have you ever found yourself stumped when it comes to picking out the perfect housewarming gift for your friends & family? We've been there, that's why we've rounded up ideas for housewarming gifts that are guaranteed to impress. Another similar idea would be to pair a bottle of champagne with pretty champagne flutes. Sometimes, choosing a paint color can be an overwhelming task. Paint color options are limitless these days, and while that’s amazing, selecting the perfect colors can be very difficult. That's why we've rounded up some of our favorite paint colors to help you choose the perfect paint color for your next project! Our favorite paint colors (from left to right): Grant Beige (BM), Revere Pewter (BM), Wickham Gray (BM), Sea Salt (SW), Icy Morn (BM), Natural Cream (BM), Manchester Tan (BM), Moderne White (SW), Shoreline (BM), Simply White (BM), Anonymous (PPG/Porter), Salty Breeze (PPG/Porter), Ashwood (BM), Swiss Coffee (BM), White Dove (BM), Hale Navy (BM), Millstone Gray (BM), Urbane Bronze (SW), Rockport Gray (BM), Kendall Charcoal (BM). We tend to lean toward warm grays and whites when selecting a neutral for your walls. They're the perfect neutrals and can be paired with both cool and warm tones. Swiss Coffee (Benjamin Moore) used on the walls in A Spanish Living Room via Style by Emily Henderson. Photo by Max Kim Bee. Designed by Emily Henderson, with photo styling for Country Living by Elizabeth Beeler. Manchester Tan (Benjamin Moore) used in our client's living space. We're also loving neutrals with green undertones, such as SW Sea Salt and PPG Salty Breeze. They feel like a breath of fresh air and evoke a sense of being near the water. Sea Salt (Sherwin Williams) used in a beautiful guest bathroom in The Midway House designed by Studio McGee. Built in bookcase and desk painted with Hale Navy (BM). Photo via Benjamin Moore. We also love dark, moody paint colors such as Hale Navy (Benjamin Moore). It's a rich, dark navy that works with both traditional and modern styles. In the above photo, Hale Navy is used on both the walls and the woodwork and pairs beautifully with the brass hardware. It feels very classic and sophisticated, but creates a beautiful backdrop for a few modern pieces, such as the coral molded desk chair and the sleek brass coffee table. Those are just a few our favorites, but we're always open to trying new colors! Do you have any that you swear by? Share with us on social media! Happy New Year! Thank you from the bottom of our hearts for shopping with us over the holidays; we had a great season and we hope you did, too! With the start of the new year, we'd love to share some of the design trends that we see coming for 2017. We recommend, if you're following the trends, choose only the ones you love and incorporate them into your unique style to create a classic look that is customized specifically to you. Overall, we’re seeing design head toward more warmth and texture, no doubt adding coziness and encouraging you to stay awhile with your loves. Raw & Warm Whites: Shades of white that have a little texture and dimension, such as chalky white and bone white, and warm whites are making their way into our homes this year. Our favorite warm whites are Spanish White (BM) and West Highland White (SW). Texture: We’re definitely seeing more and more texture and embellishments come into play in 2017. Think pleats, tufting, velvet, mohair, faux fur, luxe yarns with big stitching, and ornate hand-carved wood. A great example of mixing patterns in Danielle Moss's Chicago apartment via The Everygirl. We are seeing a lot of mixing and layering patterns in 2017. Also, the patterns are less geometric and more of an organic, handmade, textural, and warm feel. We're also loving vintage Turkish Kilim pillows & rugs, and our good friend Tara @ Woven Rugs is a great source to find them! Kate Arends's entryway is super dreamy. Image via Wit & Delight. We're obsessed with the gorgeous Peckham Rye kitchen designed by deVOL. While we still love layered neutrals, color is making its way back into the design landscape this year, especially via Dark Forest Green walls. The paint color we've been seeing everywhere is "Studio Green" by Farrow & Ball - it's rich and beautiful and pairs well with aged brass and modern whites to create a moody + modern look. Annie Sloan's "Amsterdam Green", one of the newest colors in the Annie Sloan collection, is a gorgeous option for painting furniture, frames, etc. Dresser painted in Amsterdam Green. Image via Annie Sloan. Art Deco inspired tiles from AKDO's Allure line via Lonny. Over the past few years, we’ve seen trends in Farmhouse, Modern Rustic, Bohemian, and Midcentury Modern. We think we'll be seeing an uptick in high design, glam statement pieces and patterns inspired by the Art Deco movement. Minimalism influenced design recently and 2017 is no exception. This year, we're gravitating toward well-made, quality furniture, accessories, and everything in between. There are so many vendors and makers out there creating pieces made with high quality craftsmanship, so we definitely love to support those folks. Overall, it seems like the majority of what's coming this year is stemming from the idea of creating warmth & calm in a world full of technology overload. That's a platform we can get behind! If you'd like to incorporate any of these ideas into your space, we'd love to help! Can you believe that November is about to come to an end?! It seems like this fall season has flown by. We hope you had time to savor a wonderful Thanksgiving with family and friends. Now that Thanksgiving has come and gone and December is almost here, holiday decorating is in full swing. With that in mind, we wanted to share a few simple tips and ideas to help you as you deck your halls. NOTE: We find these tips and ideas work best when cranking up your favorite holiday jams and sipping on your beverage of choice ;). Pull out your current Christmas decorations and see what you have. This can help you when you're selecting your theme and will allow you to see what you already have. Group similar items so that they're easier to find when you're ready to begin decorating. Starting with a theme & color scheme will help you narrow down a look for your holiday decor and keep consistent with your vision. The less chaotic your decorations, the more cozy and calm they will make your home feel. Start an inspiration board and pin images that you love and that are similar to your desired theme. This will be a good resource for deciding what decorations you'd like to use and what decorations you'll need to buy this year. Once you have a general idea of how you'd like your decor to look, it's time to go shopping! This part should be a breeze with your desired aesthetic in mind, as you'll be able to be more focused when selecting your items. Time to start decorating! Remember to have fun and play with different ideas. Be flexible, relax, and enjoy the process. What matters the most is that your decor makes you and your family happy! Hang wreaths on your interior windows, cabinet doors, or interior doors. For a dramatic holiday tablescape, create a festive table runner with greenery. Seagrass chargers add texture to your table all year round. Add gorgeous candles and holiday napkins to top it all off. Add a few fun Christmas pillows around the house. This is the quickest and easiest way to add cheer and warmth to your home for the holiday season. Fill a bowl, lantern, or vase with ornaments to add extra sparkle to any surface or shelf. Fill lanterns with string lights and place them on your front porch. Hang a gorgeous wreath on your front door. Decorate your stairs with pre-lit garland and ribbon on the banister. Hang a wreath on a mirror or chalkboard with pretty ribbon. Place collected branches in pretty glass bottles and hang small vintage ornaments from them. Add greenery to your outdoor light fixtures. Add a festive swag to your mailbox to greet visitors as they enter your driveway. We have an extra special room reveal for you today. This home belongs to friends that are very near and dear to us, and we can't wait to show off how beautiful their space turned out. The walls are painted with a warm white to accentuate the trim and the natural light coming from the arched windows and to contrast with the darker accents in the room. The space above the fireplace mantel was the perfect place to showcase their gorgeous black and gold framed family portrait. Our goal was to keep the overall palette mostly neutral, with pops of color coming in via the rug, pillows, and artwork. We also chose patterns that complement each other. We're in love with this nook; it's the perfect place to settle in with a good book and a cozy throw. This chair is SO comfortable and is upholstered in one of our go-to favorite fabrics. This is a great example of how you can transform an old piece into something new and fresh. One of the best design tricks we have up our sleeve is adding plants & greenery to breathe life into a space. 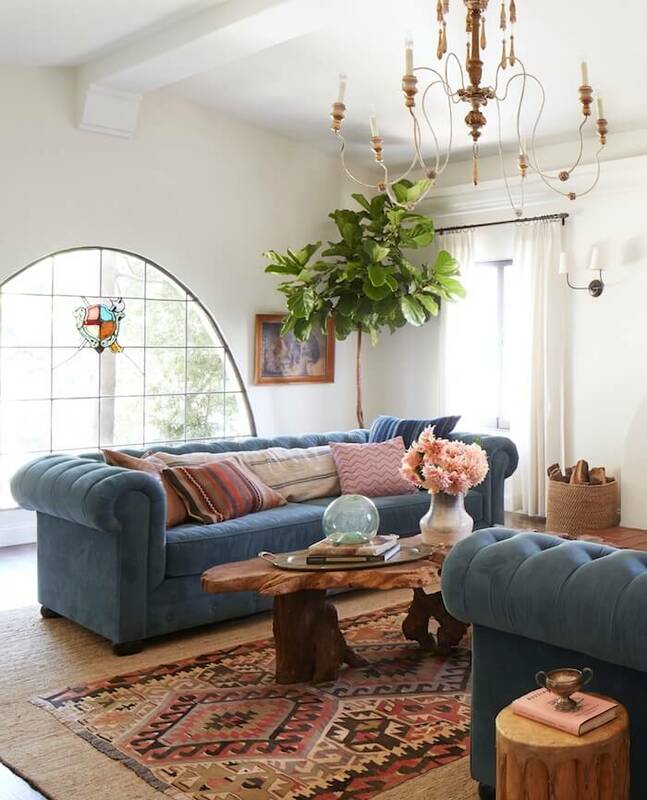 We love a fiddle leaf fig, and this one works perfectly in this space. Charlton & Park Paducah is officially open for business! 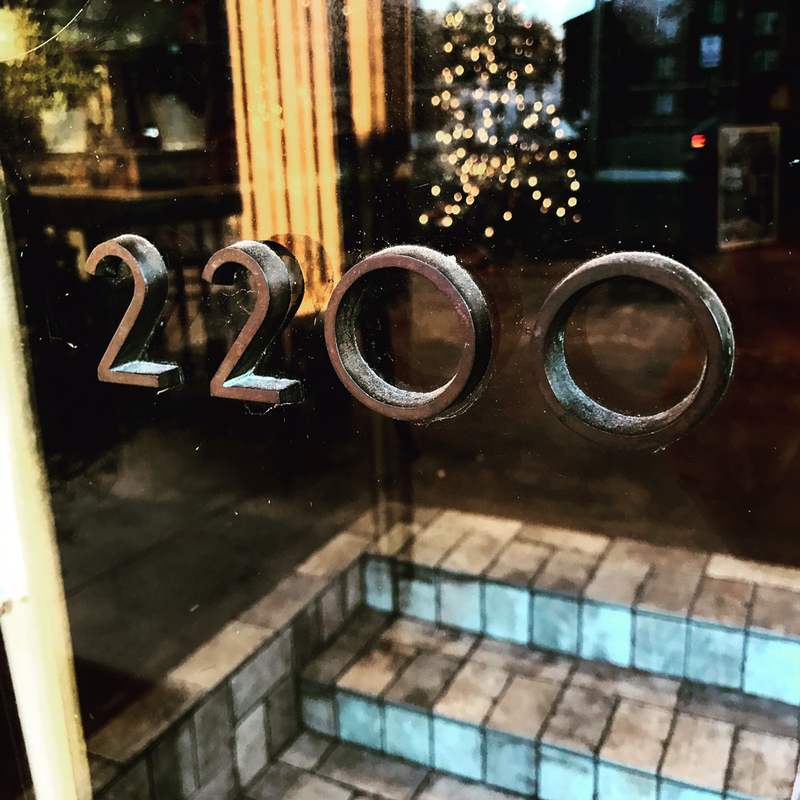 We're open 10am-5pm on Monday through Friday and 10am-4pm on Saturday, and we're located on 2200 Broadway Street. Hi there! Hopefully by now, you've heard about our brand new store opening in Paducah. We purchased the building in August and began renovations soon after. After a lot of really hard work, we're happy to say that we're on the home stretch! The store opens on November 1st, and we can't wait for all of you to come visit us there. Until then, here are some in-progress photos we've taken along the way. Here at C&P, we are constantly updating our vintage furniture finds with Chalk Paint®. There's no better or easier way to create that fabulous layered & aged look or to just brighten up a piece with a fresh new color. If you have an old piece of furniture (or decor!) that you can't or don't want to part with, but it's no longer working with your decor, we recommend giving Chalk Paint® a try! We know that painting a piece of furniture for the first time can be intimidating, so here are a few steps to help you get started. Step 1: Clean & prep your piece. Wipe the entire piece with a damp cloth and then a dry cloth to remove all of the dust, etc. This will ensure that the paint will go on smoothly. In most cases, you are now ready to start painting! No sanding or priming required! You could encounter dings and scratches that you wish to fill in. If this is the case, do so and then sand to smooth out the surface. Then clean that area. If you're painting a piece and stain starts to bleed through and turn the painted areas pink, coat the piece with a thin layer of clear shellac, let dry, and paint again. You'll also want to coat the piece with a thin layer of clear shellac if you're working with new, untreated wood. According to the Annie Sloan website, this will prevent bleeding from the tannins in the knots and open grains. Brush the paint on the entire surface of the piece for your first coat. If you're planning to distress later, one fairly thick coat should work. Sometimes you need two coats, depending on the piece and how much coverage you prefer. You can use any brush, but we really prefer using the Annie Sloan brushes when applying Chalk Paint®; they distribute paint evenly and do a great job getting into nooks and crannies. Step 3: Apply clear wax. Finally, you'll want to finish your piece with the Annie Sloan Soft Wax. First apply the wax by "pushing" it into the the paint with a lint-free cotton cloth or brush and wiping off the excess with a separate clean cloth (We prefer white t-shirt rags. You can make your own or buy them at stores like Lowes or Home Depot). Then, just buff in the wax with the direction of your paint strokes until the area is smooth and has a bit of sheen. We recommend working in sections, as this does require quite a bit of elbow grease to get the surface as smooth as possible. The piece will be dry to the touch. You can use the piece, but will need to be careful as the wax will take 5-21 days to cure. And that's it! We hope this helps you get started with all of those painting projects you've wanted to tackle. Stay tuned for tutorials on dark wax, wet distressing, and more! And of course, if you have any questions, feel free to contact us. The Secret's Out: C&P is expanding! We've got BIG news to share with you! Charlton & Park is opening a brand new location in Paducah, Kentucky! We’ll be situated on Broadway in an adorable midcentury modern building (formerly CottonTails) that’s near Midtown Market, Pipers Tea and Coffee, and Western Baptist. We couldn’t be more excited to serve the Paducah area! 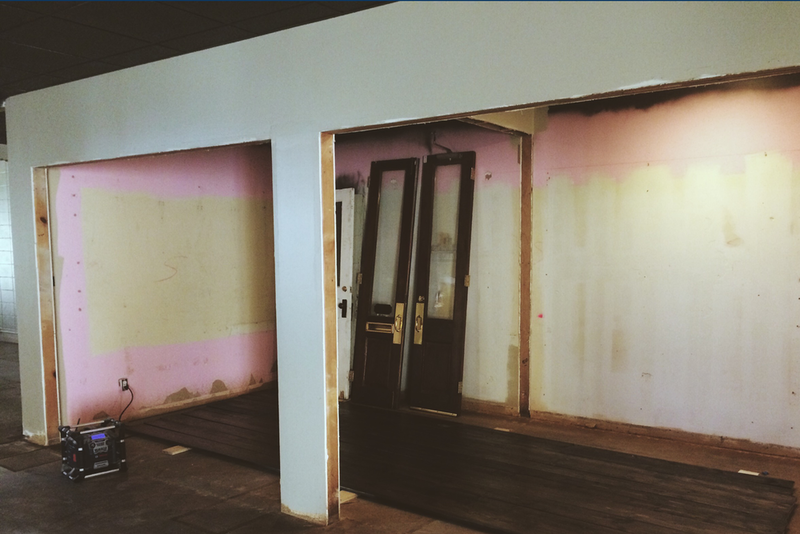 Renovations start soon, and we’ll be sure to post plenty of progress photos along the way. The grand opening is scheduled for October, so stay tuned for progress updates and official opening info. Hello! Welcome to the Charlton & Park blog. We're so excited to share lots of good info with you here such as design & paint tips, upcoming workshops & events, new product arrivals, and much much more. We're also looking forward to hearing from our customers & clients. Thank you for stopping by and please be sure to drop us a line if you have any questions or comments.